Our modern way of life fraught with environmental pollution, water contamination, deforestation, breakage in the ozone layer and industrial waste; have contributed to an oxygen reduction in an alarming way. We need to raise our oxygen levels to have better health and more energy. Synergy O2 gives your body the necessary elements to raise your oxygen levels, helping to eliminate accumulated waste inside our organism. Its powerful solution contains the essential trace minerals, amino acids,, plant sourced silica and electrolytes, all combined in a base which permits the dissociation of the water molecule in the body. SynergyO2 is rapidly absorbed by our body , creating virgin oxygen. 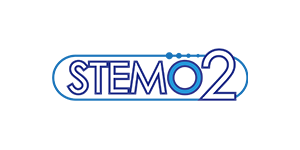 SynergyO2 allows nascent oxygen to be generated by the dissociation of some water molecules found in the body, thus forming nascent oxygen and hydrogen atoms. It's very simple. You drink SynergyO2 with water. SynergyO2 splits a water molecule into atoms of hydrogen and oxygen, this last one negatively charged. (-). Then, free radicals, which are unstable oxygen atoms positively charged, bind with the oxygen molecule negatively charged, this happens because opposite charges attract themselves. The result is a new and safe oxygen molecule bioavailable at a cellular level. Increases cellular inhalation providing more oxygen at cellular level. Provides the essential amino acids aiding the metabolism of proteins. It helps normalize the body's pH. “All chronic pain, suffering and diseases are caused due to a lack of oxygen at a cellular level"
Dr. Arthur C. Guyton MD. No, SynergyO2 is not a medicine. SynergyO2 is a nutritional supplement and works according to your body’s priorities and where it is most needed. SynergyO2 is not destined to diagnose, treat, cure or prevent any disease. Why is it important to detox our bodies and eliminate toxic substances? As we all know, our bodies are constantly being attacked by toxins in our food, water, air and other pollutants. We are more toxic than ever before, however, this is not your fault. But, it’s on you to take action and transform your body inside and out. A toxic body requires a deep-cell cleansing and that´s one the things SynergyO2 can help you with. A toxic body is known for constant tiredness, slow metabolism, digestive disorders, weight gain, immune issues, among other health related problems. Therefore, it is vital to go through a detox process in order for us to stay healthy. How can SynergyO2 provide me with the right amount of oxygen? SynergyO2’s formula is not seen in other nutritional supplements products. From the very moment SynergyO2 gets in your blood stream, your body begins the whole process. The body is capable of weakening the connection between two atoms from a water molecule. 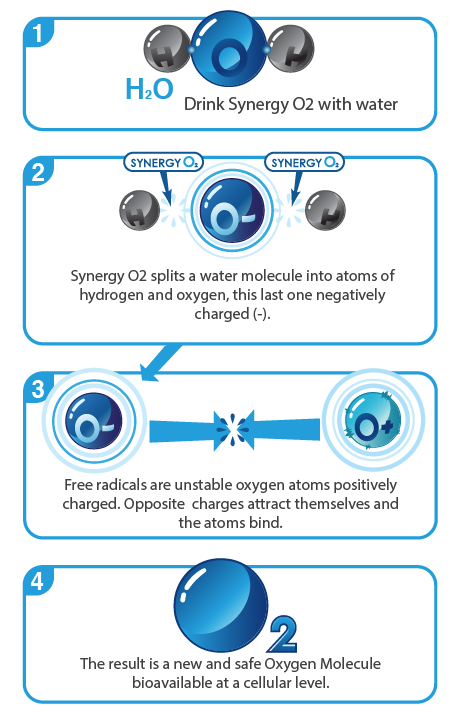 SynergyO2’s technology splits a water molecule into hydrogen and oxygen atoms, this last one negatively charged (-). Free radicals are oxygen atoms positively charged. Opposite charges attract themselves, which causes the atoms to bind. The result is a new and safe oxygen molecule bio available for you at a cellular level. A healing crisis is also known as a detox crisis. During a healing crisis, you can even feel worse than before you started taking the product. Good news is that this condition indicates that you’re getting healthier through a deep-cleansing process. When you cleanse your organism, toxins dislodge and bacteria die out giving off endotoxins. When toxins and waste is dislodged, the body begins to send them to the blood stream for them to be filtered and eliminated. 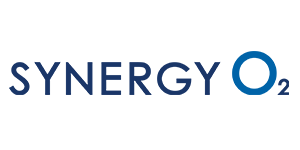 Since SynergyO2 works in a natural way when it comes to body balance, we must encourage users to keep taking SynergyO2 until they find their balance and significant changes on the body. 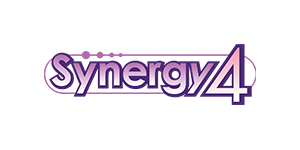 What is the shelf life of SynergyO2? By FDA requirements (US Food and Drug Administration) we must establish an expiration date. Once you purchase the product, you should take it in a 3-year period. However, you can still enjoy its benefits even though the date on the container has expired..
How much SynergyO2 should I take? In the following table you can consult the suggested doses for a cellular cleanse. For more information regarding suggested doses, please check out this document.